Environmental issues are often so labeled with buzzwords and clichés that they become annoyingly over-familiar to the general public – I’ve noticed that the eyebrows of one or two of my friends have a habit of raising slightly when they hear the words ‘global warming’, for example. That said, there are a few issues about which people seem to be disturbingly ignorant. Perhaps the most profound of these is peak oil – the fact that we are now (or soon will be) using up our oil reserves faster than we can discover new ones. This probably means the end of cheap energy and it has far reaching effects on every aspect of our lives. It’s not the end of the World say some (and they’re right), but it is (and you can sing this bit) the end of the World as we know it. Here in Britain we’re uniquely well-placed to adapt to the challenges – we have unparalleled resources when it comes to alternative energy; we have a well-educated population with a history of resilience, adaptation and invention; we even have the ideal climate for growing food. What we need to develop is some kind of public will to see the changes through – a Blitz mentality if you like, and I really don’t think the comparison is over-egging the pudding. I don’t think such a thing will happen spontaneously, unless a very significant event takes place – something on the scale of Norfolk disappearing under water. So what we all need to do is to start putting into effect small changes, manageable steps and positive, sustainable solutions. As these become familiar we will move further and further away from the oil economy and ‘business as usual’, and we’ll develop a resilient society where quality of life is a more important measure of our success than gross domestic product. I’d like to invite you all to think about small changes you can make to your lifestyle with this in mind. Can you walk to a local baker in the morning, rather than shopping at a supermarket out of town? You’ll get better bread from a local source, and the exercise is no bad thing. Or perhaps you can think of new uses for old things, rather than throwing them away? On a similar note, in one of Joy’s posts to this blog last year she mentions the Turtle Bag and how versatile it is. She even asks readers to suggest alternative uses, and I have to say I think I have a pretty good one. Each morning, at about seven o’clock, I go out onto a little local nature reserve with my dog, Stig. Obviously this is primarily for Stig’s benefit, but this year I have been taking the opportunity to learn a bit about mushrooms. I’m now at the stage where I can confidently ID several tasty varieties and bring them home for breakfast. While it’s easy enough to stick my harvest into a normal bag as I pick them, I’ve always thought it slightly wasteful of all the spores the mushrooms release as they jiggle and shake all the way home. If only I had some kind of mesh bag, I could be releasing those spores all over the grass, ensuring good foraging for future seasons… you see where I’m going? 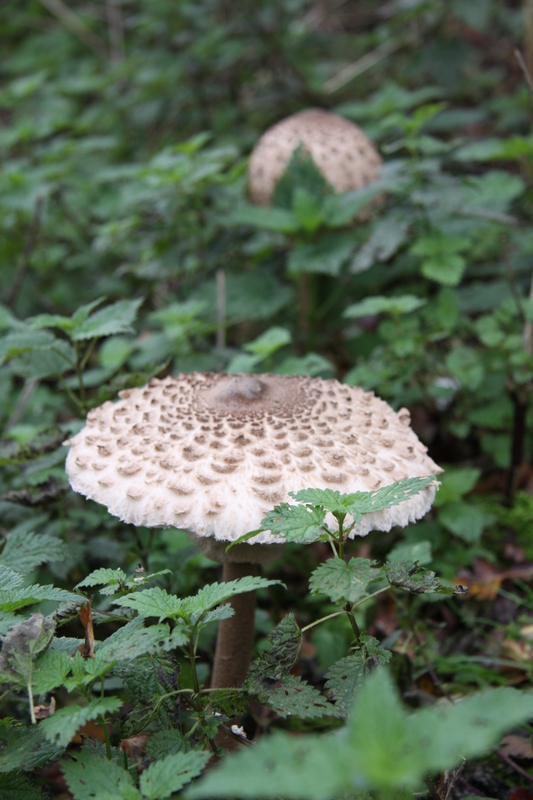 So there you are; an example of how easy it is to provide something for yourself (and a few parasol mushrooms are well worth the effort, believe me), and also to find a new and practical use for an existing resource. « Hi there! I’m Paul Wagland. Isn’t the mushroom in the photo a poisonous Amanita? Happily, as I’ve now eaten it, this is most definitely a parasol. It has dark scales on the lighter background of the cap, which would be quite the reverse if it were an Amanita such as a panther cap. The picture perhaps doesn’t show the size of this mushroom (20cm across, which is larger than any Amanita) or the dappled stem and movable ring. There really is no mistaking a parasol (at least in the UK) once you know what to look for.